College canteen is blessed with family atmosphere, with a variety of delicacies, touched by a home made flavour, cooked to perfection and served with a great courtesy. 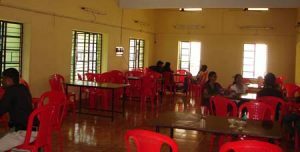 Refreshments are available at the college canteen at affordable rates. Adequate seating facilities are provided to accomodate students and staff even during peak time. At present, to ensure quality and hygeine, P T A is running the canteen.